A low level drug dealer, David Clark (Jason Sudeikis) is robbed which later made him owes his supplier aka the boss. he is definitely dead and being forced to smuggle marijuana from Maxico to clear the debt. it is too suspicious of a man travel by himself across the border, so he creates a fake family of the "Millers" who going on a family vacation in a big RV. He invited Rose (Jennifer Aniston), the neighbor who works as a stripper to act as his wife. then, adding the 18 years old virgin Kenny (Will Poulter) poses as a son and a runaway girl, Casey (Emma Roberts) as the daughter. they were all undergo 'transformation' as to make it looks more real. While on the 'vacation', they keep on stumble upon the Fitzgeralds family who's the man is actually a DEA agent. so, that is the starting of all the chaos plus the four of them were actually stealing the marijuana from Chacon, a big drug lord in that land. so, they were like running from two sides. Thus, don't wanna elaborate more as this movie sure a slight entertainment for you to enjoy on this weekend. 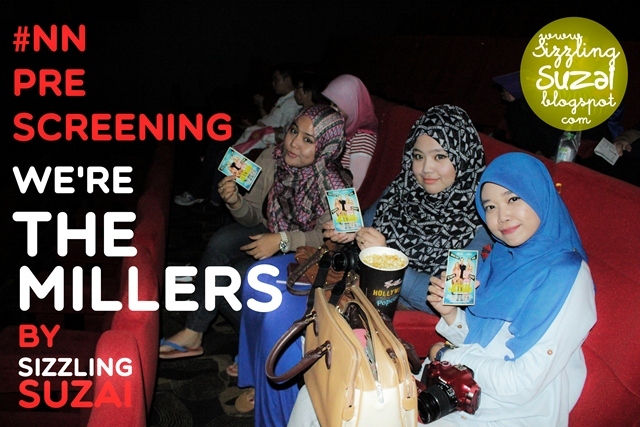 yup, already released at the cinemas all over Malaysia since on the last 29th August 2013. just visit the nearest cinema and book your seat though~! lah babe, u ade ker? I ngan kifly pown ada that day kot... tak terserempak langsung.